Speedy service and unique offerings are critical for small businesses that want to compete with an e-commerce giant. More small business owners in the retail industry are rethinking how they move products, and technology is a big reason why. 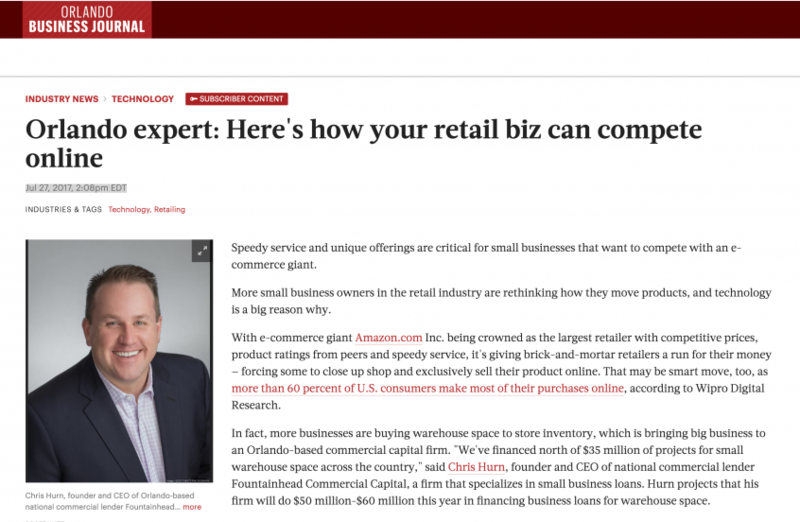 With e-commerce giant Amazon.com Inc. being crowned as the largest retailer with competitive prices, product ratings from peers and speedy service, it’s giving brick-and-mortar retailers a run for their money — forcing some to close up shop and exclusively sell their product online. That may be smart move, too, as more than 60 percent of U.S. consumers make most of their purchases online, according to Wipro Digital Research. In fact, more businesses are buying warehouse space to store inventory, which is bringing big business to an Orlando-based commercial capital firm. “We’ve financed north of $35 million of projects for small warehouse space across the country,” said Chris Hurn, founder and CEO of national commercial lender Fountainhead Commercial Capital, a firm that specializes in small business loans. Hurn projects that his firm will do $50 million-$60 million this year in financing business loans for warehouse space.